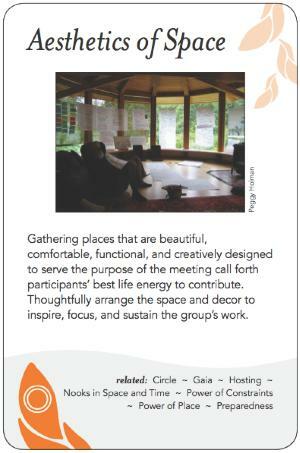 Gathering places that are beautiful, comfortable, functional, and creatively designed to serve the purpose of the meeting call forth participants' best life energy to contribute. Thoughtfully arrange the space and decor to inspire, focus, and sustain the group's work. The aesthetics of place are an essential part of the "field" of an event, and can have a major impact on the energy, mood and openness of a group. Beauty acts on both conscious and unconscious levels in its effect on groups. A beautiful space can evoke a subtle sense of gratitude and help soften the collective heart, opening the opportunity for deeper levels of work. Space arrangement should be part of the event design, done and checked thoroughly in advance of the event. Too many times, the space aesthetics and functionality are an after-thought in meetings and events. We end up in places with no natural light, no wheelchair access, or a noisy heating/air conditioning system. Use this pattern in tandem with Power of Place to make sure your location supports your program. Ideally the space you'll be using has been well-designed for what you want to do. However, many facilitation spaces are either temporary, designed principally for some purpose other than meetings, or simply designed poorly. Thus we sometimes need to apply our creativity to make these spaces appealing, or adapt our planned activities to take into account what is possible there. Facilitation is largely about working with a group that is brought into a space. Is the space new, or familiar to the facilitator or participants. What time and resources do you have to adapt it, work with it? Holding an event repeatedly in the same space with the same setup creates a sense of continuity. Changing the setup or moving to a new space, breaks up expectation patterns and can either disturb, or reenergize. When participants first walk into a space it presents clues as to what may happen there. It sets a tone: you know how many people are expected, use of technology, level of interaction. For example, compare a university lecture hall to a room set up with round banquet tables. Which would you choose if your objective was interaction? To the extent you can, choose the space and set up the room to be congruent with your objectives. Size: Neither too large nor too small for the group; enough so that all participants can move around, find a corner to themselves, have room to put personal things, coats; neither claustrophobic nor oversized. Arrangement: What arrangement will support your activities? For instance, a Circle in the centre with breakout work tables around the outside allows a group to come together, then work as individuals or small groups, with easy transitions in the proximity of community. The roundness is archetypal, everyone can see each other, and it's easy to go around the circle so that people know who is next. See also Nooks in Space and Time. Centre: A vase of flowers, fire pit, or coffee table in the center provides a focal point when sitting in a circle. Sometimes, however, you might want space in the centre for a speaker or performer(s) to move around and address the group. Furnishings: Can the furniture be reconfigured to get the arrangement you want? Appropriate (varied, comfy) seating allows everyone to feel at ease, especially when sitting for long periods. Do you want tables for writing on, or will they block intimacy? Can you have a combination of spaces within the room? Lighting: Windows on two or more sides of the room provides a more pleasant environment than a single source. Skylights offer natural light. Also consider careful use and placement of other forms of light, for example candlelight to create a sense of intimacy and warmth. Diffused light, or even total darkness, may be employed to allow the emergence of 'internal light', or to encourage a more reflective or ceremonial feeling. If there will be slides or video, make sure the room can be made dark enough to see them, but not so dark people can't see each other, or are likely to fall asleep. Beauty and function: Plants or flowers humanize the space, subtly supporting the affective domain. Be conscious about whether you want food in the room (intimacy, convenience), and/or outside the room (a place to go to). Soundtrack: Introduced sounds and music - appropriate use of background music, musical performances for energy shift or inspiration, bells to indicate the start and end of activities, and the tone and volume of voices (use of amplifiers, microphones etc.). Also consider the sounds, natural or introduced, musical or ethereal, in the space, including sounds like a bell to signify the end of a time-limited event, and even the tone of the facilitator's voice, and their impact on the mood and energy of the group. Often you have to work with what space you're given. Consider how to work with a space that is less than desirable. What are the most important characteristics to address? What are the simplest antidotes to common problems? Consider security issues: compliance and relationship to security personnel (e.g. leaving doors and windows open for fresh air). Identify and remove, or cover (or decorate!) distracting or negative signs and features. Natural environment preferable to manufactured - Example: a group who met at a beautiful location near the sea but, for fear of distraction, did not open the curtain. Working with the space you have: Dave had the experience of speaking right after Al Gore, in a large venue holding 2000 with a small audience of 25. Solution: move to another venue and make a circle of chairs, or if that's not possible, go outside. A vase of fresh flowers can make a big difference; so can PlayDoh for people to play with while listening. World caf? table layout includes newsprint for people to write on. A Pattern Language www.patternlanguage.com is about the architectural patterns that make a space work.